So here's a fun fact; I have already written and scheduled this post once only my internet failed and my platform went back to the last point it remembered......back when all I'd uploaded was THE PROMO PHOTO. So I've already written this once and it left me at 11pm last night when I didn't have enough time to re write so my plan to have it go live as the perfect was to spend a Sunday didn't pan out. You'll have to forgive me and just embrace it on this cold dark Monday evening. Thanks gal pals. Hygge is the buzzword of the blogging community right now. We're a gang of trend addicts and the concept of Hygge and how we implement it into our lives is our new thang. Hygge (pronounced Hoo Gah by all accounts) is a Danish word that doesn't translate into a single word in the English language, it takes a good paragraph for us to get the same idea across but it's a whole way of life, a way of appreciating, so much more than just 'cosy'. This weekend has been a mad one, like I can't even go into detail on how hectic it's been, I think it's going to need a whole intro of it's own in my Friday Favourites at the end of the week but safe to say a few hours of Hygge on Saturday was just what the doctor ordered. In hindsight, what I didn't realise was that the chaos was only just brewing and it was just going to get more and more mental so looking back on these photos is like the calm before the storm. 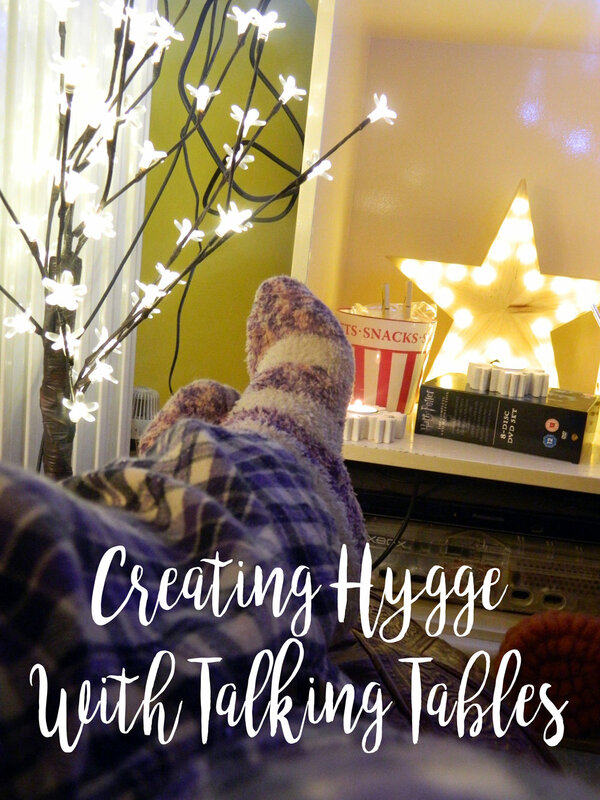 On Saturday afternoon I decided to get all Hygge up in here and out came the dairy lights, the lights went off, the TV went on and the phones went away and we had a little window of Hygge bliss before it all kicked off again. Autumn is the perfect time for Hygge, it's the season of wrapping up and spiced drinks and whacking the heating on and wrapping up in a big blanket and that's the very essence of Hygge. It's probably worth mentioning here that these photos aren't edited and I hope that means you can appreciate just how cosy it was with the lights glowing orange and blue and oh my lord it's the Autumnal dream. Rule number one, blankets are Hygge musts. The thicker and fluffier and softer the better, preferably if they're oversized and can fit about 10 people under one. It could even just be your duvet brought down to the sofa, idk, go wild you little beans you. A few Christmasses ago Joss' mum (knitter and weaver of the gods) made me the best blanket I have ever seen, it's yet to be rivalled and I fear for the day it wears a hole. It's like 10 inches thick, it's black primarily and full of multi coloured flecks and it's like a dead weight. It's beautiful. Oh mumma, Hygge must number two. Fairy lights are underrated in my life, I've had a variety of strings of fairy lights and whilst they always look pretty, I probably only turn them on once every 6 months. This time though I switched on every single string of fairy lights which I'd hung on the shelves and my new favourite homeware piece, this star light and I can confirm, more is definitely more. Get ALL the fairy lights on, don't scrimp, don't worry about your leccy bills, for one evening just get all the cosy on. I'll hold my hands up here and admit that whilst Hygge is the latest blogging trend (and one I can fully get on board with), I have been familiar with the concept, albeit not the word, for a while now. I bought this book last year or maybe even the year before and it's an illustrated dictionary of sorts of all kinds of foreign words that don't translate into one single word in the English language. It's the kind of words that explain a feeling, an emotion, a specific event or moment and it's GORGEOUS and you should all go and read it. If you're having a Hygge night in with fairy lights and blankets is there any better way to embrace it whole heartedly than to get a movie marathon on? For me, Autumn means Harry Potter. I don't know if it's because of the Christmassy snowy scenes, I don't know if it's because of the time of year they were released but I NEVER watch them in the summer. So ok maybe we only got through the first film before real life brought us back to earth and ok so we didn't have the marathon we thought we might but it's still SO beautiful and makes you feel all warm and like you're 12 again. Oh and I quoted 90% of it which I'm pretty sure made the whole experience better for Joss. Right so hands up here, I didn't actually have a brew or even a hot chocolate or something in my Hygge afternoon. As I am a proper adult (didn't you read this post last week) naturally the only milk we had in was out of date and we had to pop down the shops the next day. Life. Instead we had a cheeky Pepsi and we got the chance to use these cups so that's not all bad right? Hygge is perfect for a warm cuppa with loads of sugar and some marshmallows if you're feeling particularly naughty. Same effect as the fairy lights but means you can have ULTIMATE COSY LIGHT and, breaking news here, you can get scented candles. I actually really don't like scented candles, I cannot stand strong smelling stuff but I do own a few super mild ones and actually they just add a little bit of summin summin to the smell of fire. Fun fact, I made Joss light them all because I am not to be trusted and he burnt himself with a match. We lead such a wild life. For Hygge parties light ALL the candles, safely obvs, and snuggle down with your movie and your drink without any lights on. I don't know about you but I need very little excuse to get the snacks out but ya know, Autumn inevitably means bulking because we all know we need an extra layer to see us through these cold spells. If you're embracing a bit more Hygge in your life I consider it essential to get some really naughty carb filled sugar covered snacks in to share with your nearest and dearest (or well, yourself). We have a bunch of this range of homeware from Matalan and we keep this sweets and snacks bowl in our living room for all our mindless snacking and whilst we eat from it....it NEVER SEEMS TO DEPLETE. I have a sneaking suspicion Joss fills it whenever he goes late night shopping at Tesco. So if you haven't grasped it by now, Hygge is in very loose terms is an atmosphere. It's appreciating small things, it's cosiness, it's a warm blanket and a movie and some candles and it's spending it with your favourite people laughing and spending time and remembering and creating memories. I spent my Hygge day with Joss in our teeny tiny living room not big enough for other pals to join in but implementing more Hygge into your life calls for spending quality time with your ride or dies. Hygge I'm sure is something we can all take stock of this Autumn. As the weather turns and the rain lashes down outside and the heating comes on I for one am going to make it part of every weekend that my life allows. Joss doesn't have a lot of time off from his work, especially in the Winter so making the most of the time we do have with a Hazza P film and a bar of chocolate thrown in makes a lot of sense to me. On Saturday he switched his phone off, I took these photos and then we settled down in pjs. I didn't blog, I didn't schedule tweets or worry that I'd only posted on Instagram once and ya know what....my stats dropped sure but they didn't drop through the floor and the world didn't end. And it was BLISSFUL in an otherwise insane weekend. So here's where I should admit I had a little help setting up the perfect Hygge scene. A few weeks ago Talking Tables reached out to #BloggerPitP organisers and guests to work with us on some collabs and I wasn't the only one to jump at the chance. You might remember when we hosted the picnic way back in August that Talking Tables were one of the brands that helped us out (read all about it here) so I knew I wanted to get involved with them again. Ya know what makes the best type of blogger and brand relationships? Ones where the blogger gets allllll the creative freedom. Talking Tables asked me to choose a few pieces from their INSANELY vast range but being difficult little me, I mentioned I had the idea for this post and asked them to send me a surprise and man oh man did they make this gals day when the biggest box of blogger mail found it's way to my doorstep. Talking Tables if you aren't familiar with them already are a company specialising in party accessories, decorations and all manner of gorgeous goods. They're ethos is 'It's Time To Get Together' and from just the briefest look on their website you can absolutely see why. From party goodies to homeware to baking accessories I thought the Talking Tables website was jam packed of stuff I wanted before I saw the button that said 'Talking Tables has over 50 ranges of products'. That's not over 50 products. That's over 50 RANGES. Like you need a good afternoon to scout through it all. Like all companies there's different price points to suit all kinds of budgets but on the whole none of it is going to break to bank. Not only that but there's something for everyone, like everyone. I didn't want to pick some party wear because I knew my baby living room wouldn't hold a knees up but the homeware, holy moly oh the homeware. Baring in mind I gave Talking Tables a VERY vague request for a surprise I could not have loved the gifts they sent me more. Not only was there LOADS of it (like actually I could have cried) it was the bloggers dream. I'm talking marble, I'm talking white, I'm talking gold, I'm talking copper.....you will die. What sells it for me is how easily it fitted in with our current homeware and decorations. 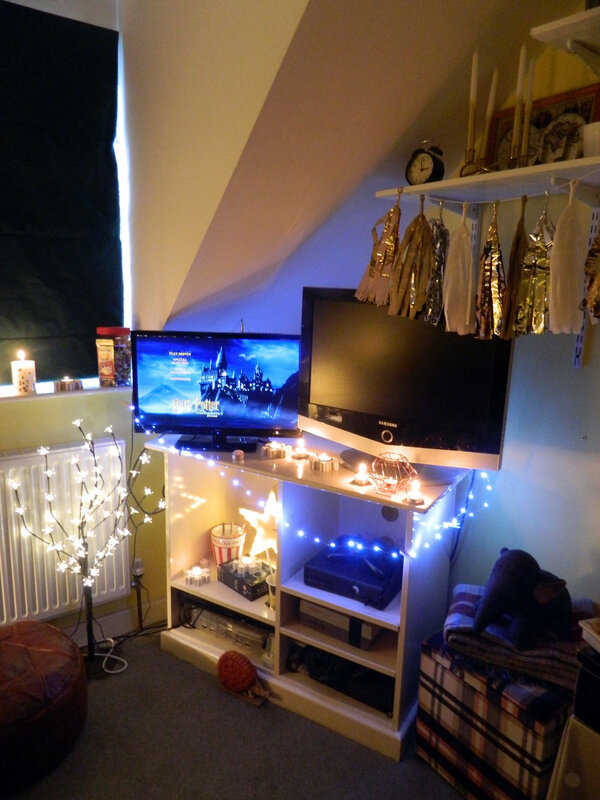 We don't have a particular theme for our decorating, it's all a bunch of stuff we owned separately or collected in the past 10 months of living together and the candles, the coasters, the lights...they all fitted in like they'd been there all along. Admittedly Joss wasn't overly keen on the floral fairy lights or the metallic tassels so I've let him off those and they've moved into my office but all in all, if the majority of it gets the boyfriend seal of approval you're onto a winner. It's also worth mentioning I was also sent a pub quiz game which I haven't seen since I unboxed it because my Dad stole it because he loved it and wants us to play it at Christmas. So HUGE thanks Talking Tables for pleasing the fam AND giving me the cosiest most all encompassing Hygge afternoon in an otherwise bonkers weekend. * The items in this post were given to me for free by Talking Tables but all thoughts, opinions and Hygge love is very much my own. All items are linked for your shopping spree below (just call me your dream enabler). Blossom & Brogues Rose Tealights - £7.00 per pack. Blossom & Brogues Flower Lights - £19.50. Party Porcelain Gold Dinner Candles - £10.00 per pack. Fluorescent Floral Copper Tealight Holder - £11.00. Party Time White Table Lights - £9.50 per pack. Simply Gold Table Scatter - £2.75 per pack. Decadent Decs Metallic Tassel Garland - £14.00 per pack. Modern Metallics Paper Cups - £4.50 per pack. Modern Metallics Hexagonal Card Coasters - £7.00 per pack. Modern Metallics Gold & Silver Foil Straws - £3.00 per pack. Nordic Christmas Wooden Star Light - £28.00. Nordic Christmas Wooden Pegs - £4.00 per pack. Nordic Christmas Tea Light Holder - £5.50. Nordic Christmas Shaped Napkins - £4.00 per pack.